Who’s The Best Formula One Driver Of All Time? Use our chart to track your favorite. The greatest drivers in the world are assembling in Monte Carlo this weekend for Formula One’s flagship race, the Monaco Grand Prix. 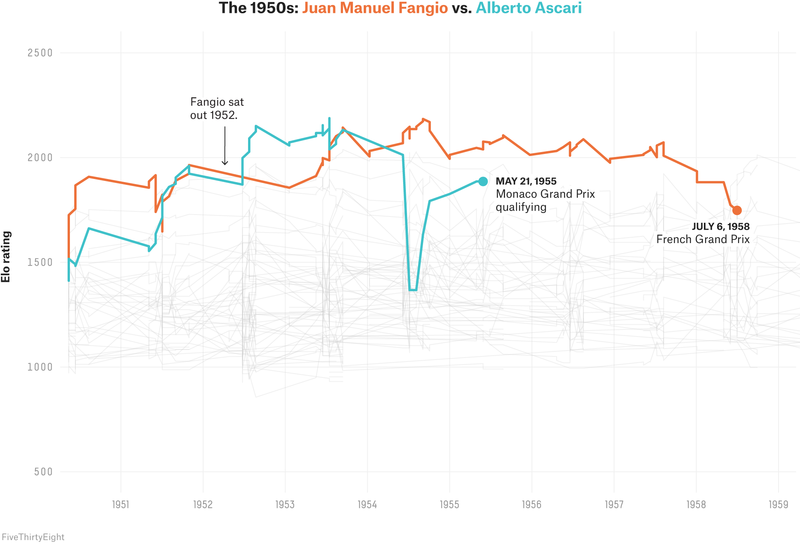 So we thought it was the right time to dive into the history of road racing’s fastest sport — and this being FiveThirtyEight, what better way to investigate that history than to use our favorite benchmark, the Elo rating system, to rate every driver of all time? Elo is a simple way to grade competitors based on a series of head-to-head results. Longtime FiveThirtyEight readers will know that we’ve put it to work before in ranking NFL, NBA, MLB, college basketball and football, and women’s and men’s club soccer teams. 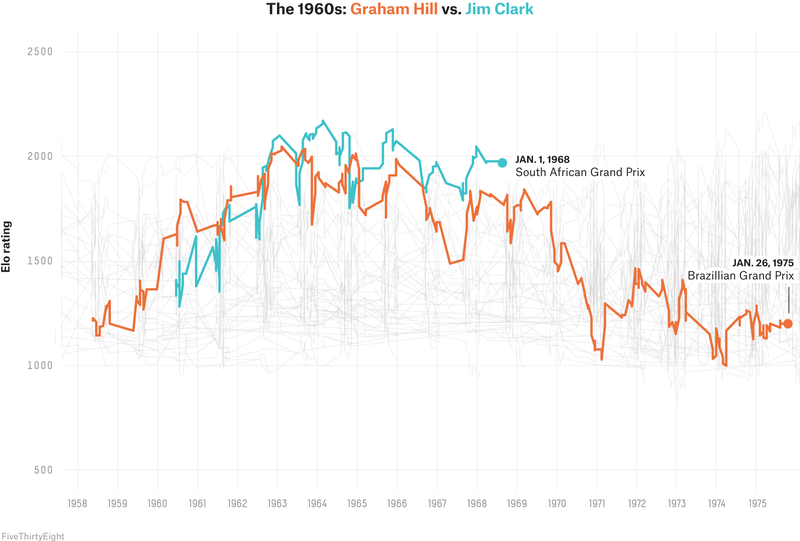 Here, we’re using it to rate F1 drivers going back to 1950, the first season in which the FIA World Championship of Drivers was staged. Rating each contestant in fields of more than 20 drivers is a bit different from rating teams that play one-on-one games, so we had to make a few tweaks to our usual Elo formula. (Skip to the bottom for all the details.) 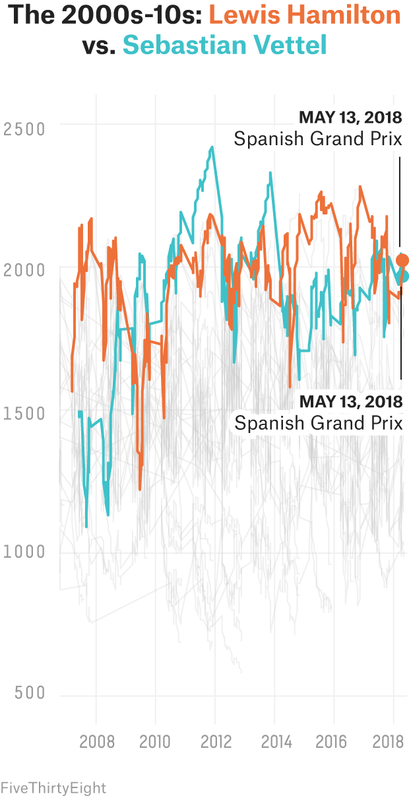 The short version, though, is that all drivers are assigned Elo ratings going into each qualifying session and race, which represent their form — along with that of their engine manufacturer, mechanics, pit crew and so forth — at that particular moment. The average is around 1500, with the best racers soaring into the 2000s. After each event, the driver’s rating will change based on the result: In general, finishing high helps you gain Elo points, while finishing low costs you Elo points. (Duh.) If a driver doesn’t finish a race, Elo acts as though that driver never entered the race. That avoids the question of fault for a crash or a mechanical failure, though it may reward drivers who take more risks to finish higher. It may also reward drivers who qualify well but do poorly on Sundays. But the best racers will consistently outduel the highest-rated of their peers. Most racers, of course, aren’t in that category. But a few drivers In F1’s history have managed to dominate for long stretches of time; sometimes they even came along at the right time to have an epic rivalry with another all-time great. 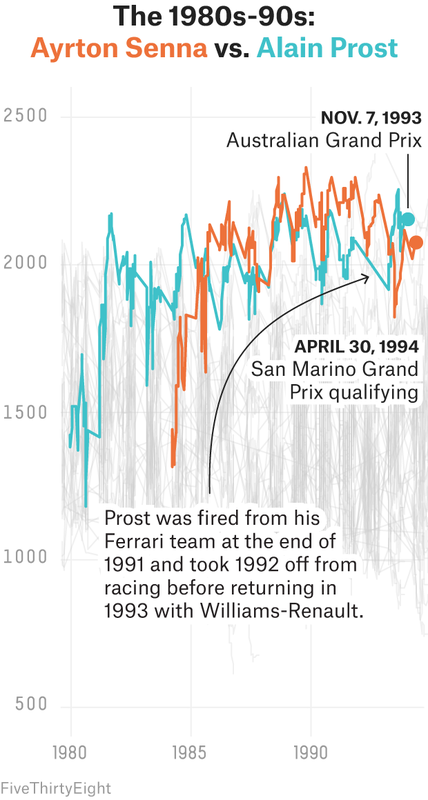 You can see these legendary racers highlighted in the chart above, which you can also search and click to isolate other individual drivers’ ratings over time. So … who’s the best ever? * Includes the 2018 season, which is currently in progress. 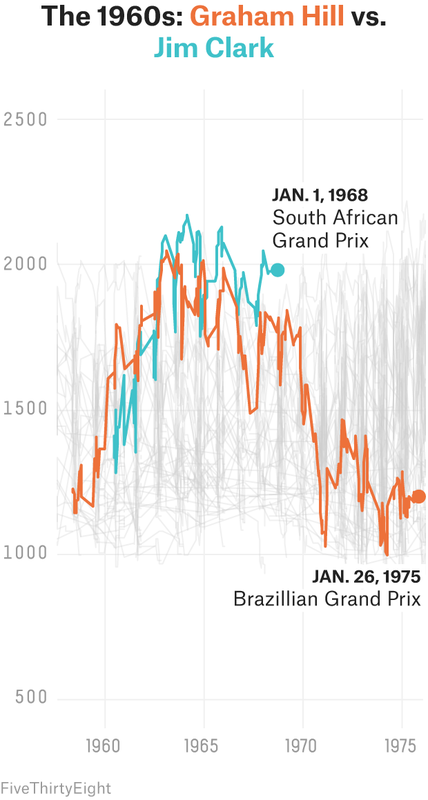 To be eligible, drivers prior to 1970 needed to take part in 25 percent of the season’s races and qualifying sessions. 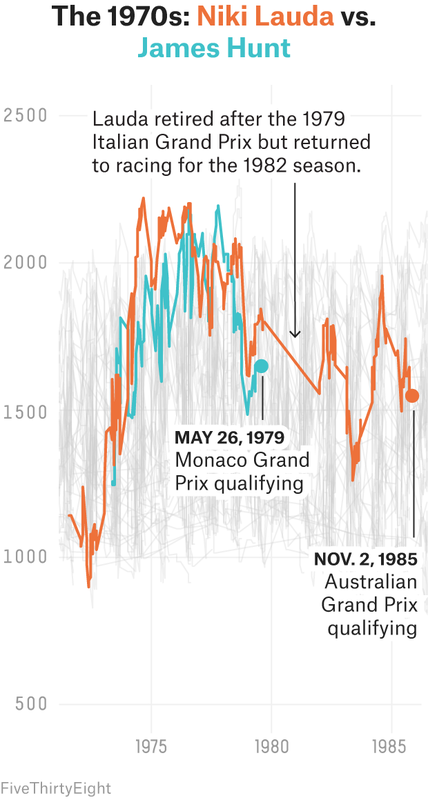 Drivers since then needed to participate in 60 percent of the year’s races and qualifying sessions. This should come as no surprise to racing fans — Senna is regarded by many other champions as F1’s greatest driver. 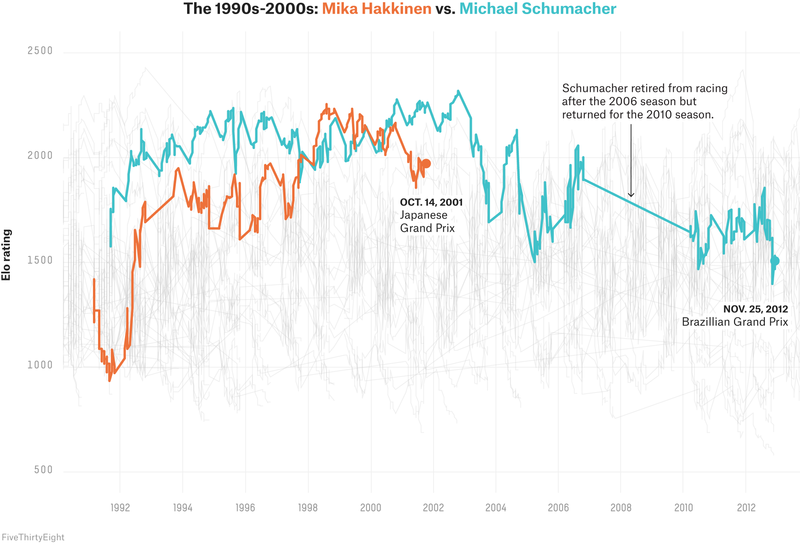 Nor is it a shock to see Michael Schumacher, the seven-time World Champion, coming in at No. 2. But what’s striking is that Nos. 3 and 4 in the ranking above are current rivals: Lewis Hamilton and Sebastian Vettel. How lucky are modern F1 fans, that we get to see two names on the all-time short list of greatest drivers going head-to-head every few weeks? Friends away from the track, Niki Lauda (No. 8) and James Hunt (No. 17) had a fierce rivalry behind the wheel that peaked during the 1976 season. Lauda went into the year as F1’s top-rated driver by Elo before suffering a fiery crash at the German Grand Prix that nearly took his life. Six weeks after being given last rites, Lauda somehow bounced back to finish fourth at the Italian Grand Prix. 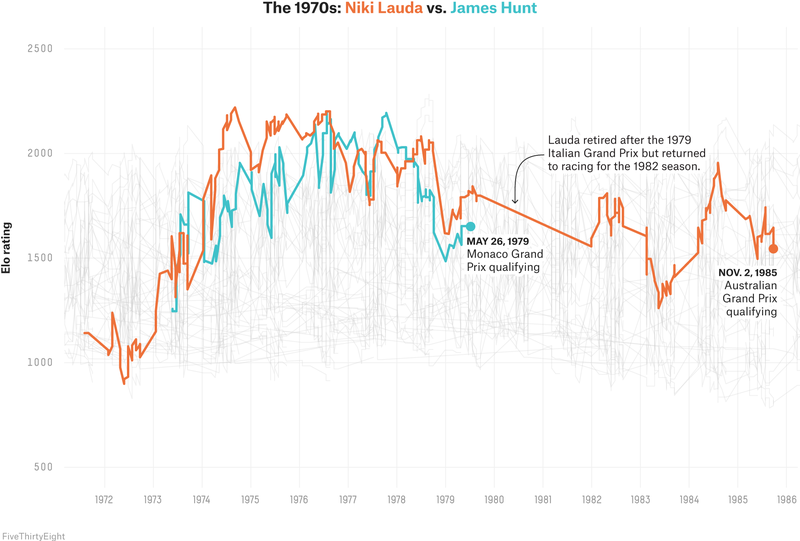 But in the end, Hunt ended up eking out the 1976 title by a single point over his Austrian rival. Hunt was quick again the following season, but he was unable to keep his car on the track; he took six poles to Lauda’s two but retired from eight of 17 races, six of which were due to mechanical failure. Lauda took advantage, claiming his second title in three years. France’s Alain Prost (No. 6) won a grand total of four championships in his career, tied for the third most ever. But from 1988 to 1991, he would claim only a single title, thanks largely to the otherworldly skills of Ayrton Senna (No. 1), his one-time McLaren teammate. 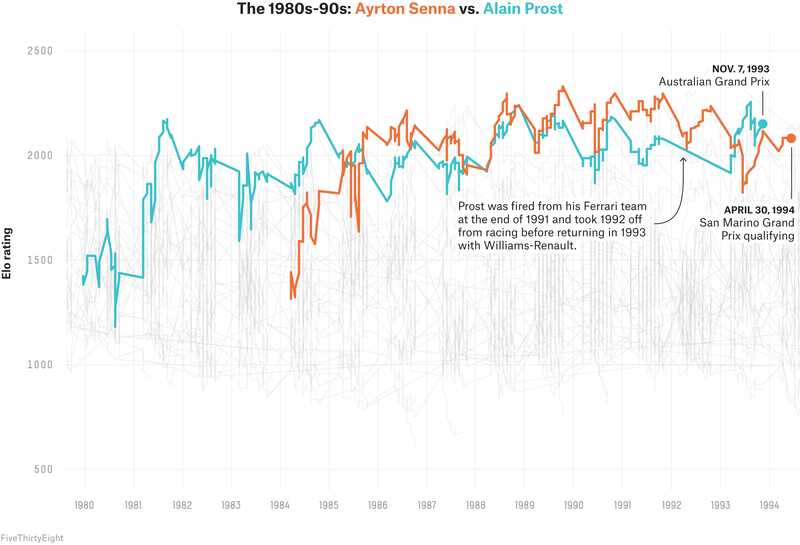 Senna won more than 40 percent of the races he entered during that span, peaking with one of the highest Elo ratings ever in 1989. Even Prost’s lone title in those seasons — in 1989 — was more about Senna’s bad luck than Prost outracing him; although Prost beat his teammate only once all year in races they both finished, Senna suffered six retirements2 to Prost’s three. Senna was so dominant that Prost ended up leaving McLaren for Ferrari in 1990; the rivalry would continue off and on for the next few seasons until Prost retired after his 1993 championship. Senna died the next year in a crash in the San Marino Grand Prix. Prost was a once-in-a-generation driving talent, but he had the misfortune to race against Senna, a once-in-a-lifetime phenomenon. From 2008 to 2017, Lewis Hamilton (No. 3) and Sebastian Vettel (No. 4) won the F1 title every season except for two (2009 and 2016) — and one of them was runner-up in each of those years. And yet, we’re somehow only reaching the peak of this rivalry right now, since the dominant periods for Vettel’s former team, Red Bull (2010-13), and Hamilton’s Mercedes squad (2014-16) didn’t quite overlap. Starting last season, though, we’re finally getting some direct competition between these two four-time champions, and it’s given us moments like this deliberate collision at the 2017 Azerbaijan Grand Prix. 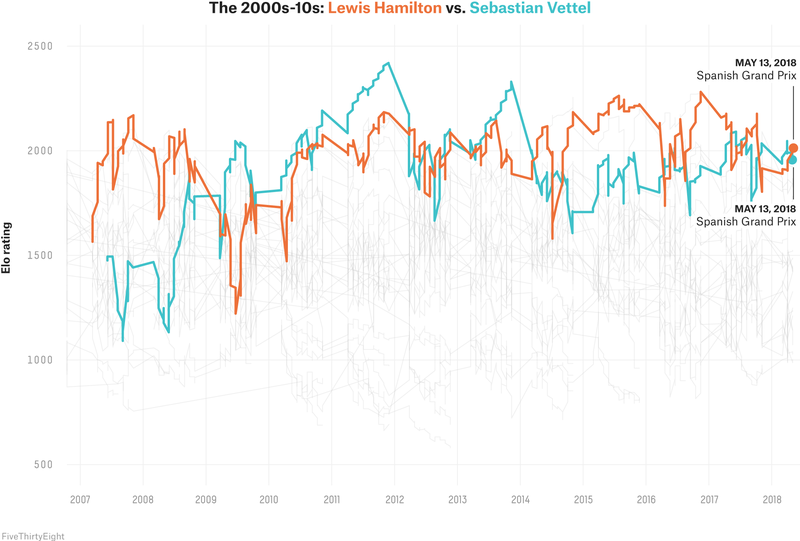 According to Elo, Vettel has one of the best peak ratings of any driver ever, and Hamilton isn’t far behind, so if these two continue on their current trend, there’s plenty of room for the legend of this rivalry to grow. Each session or race is treated as if it were a round-robin 1-on-1 tournament. A driver who finishes second out of 15 cars is viewed as having gone 13-1 in this tournament, losing to the first place finisher and defeating the rest. Elo includes each race that awards Formula One championship points3 and the primary qualifying session for that race. If a driver fails to finish a race — whether because of mechanical failure or a crash — we treat that driver as if he or she didn’t compete in the race. This may reward drivers who are overly brave (or stupid) by not punishing them, or cars that were quick yet unreliable, but it avoids having to assign blame in controversial incidents or, even worse, clear cases where a crash was not a driver’s fault. Like several other FiveThirtyEight Elo systems, the average driver has an Elo score around 1500, while new drivers start with 1300 points. The “K-factors” in this version of Elo — which are multipliers that determine the sensitivity and fluctuation of a driver’s rating — are more extreme in the beginning of a driver’s career. Drivers start with a K-factor of 24 for approximately the first year, then reduce as they gain experience. Qualifying results are predictive of race results, which makes sense considering that qualifying results both set the starting grid for the following race and allow for drivers to demonstrate their raw speed and talent on a level field. The minimum K-factor for qualifying sessions is 16, while the minimum K-factor for races is 12. Drivers always gain Elo points after “defeating” another driver and lose ground after “losing” to them. The overall system is zero-sum, in that the total number of points remains constant before and after a session or race, but given that each session or race can include drivers with a range of K-factors, there can be asymmetric point gains and losses. We adjust for this by normalizing participants’ scores after each session. Without this normalization, it is possible in the short term both for Elo deflation to occur — a new driver does poorly and gives away more points than the opponents claim — and Elo inflation to occur — a new driver does well and gains more points than opponents lose. Given the rapid driver churn in Formula One — especially during the early years of the sport — these effects would be more noticeable than in other sports and would quickly lead to skewed rating scales across the seven decades of championships. 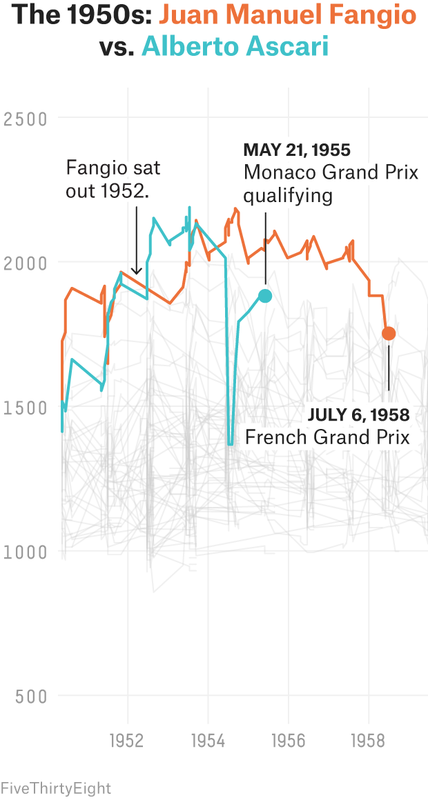 To build the Formula One Elo, we used the historical race results compiled at github.com/emkael/elof1. These were pulled from various sources: Data for the 1950 and 1951 seasons came from Wikipedia, for 1952 and 1953 from second-a-lap.blogspot.com, and for subsequent seasons from ergast.com/mrd. Data for qualifying races was also pulled from chicanef1.com. Additional contributions by Gus Wezerek. 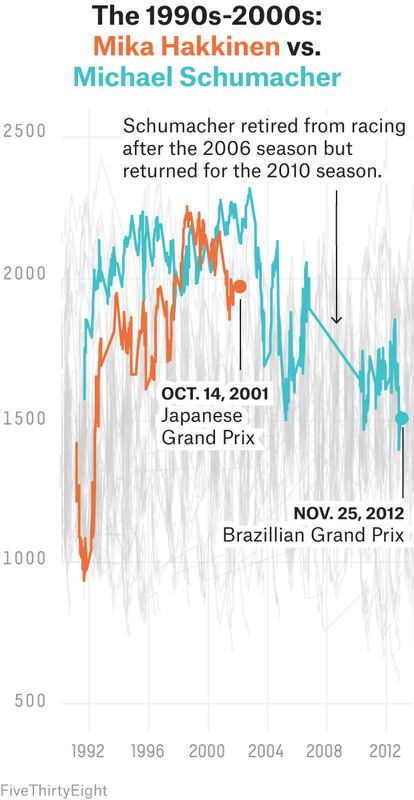 This threshold varies by era because of the low rate of finishing races in the early days of Formula One. Prior to 1970, a racer must have appeared in 25 percent of all races and qualifying sessions to be considered a participant that year; after that, the threshold was moved to 60 percent. Except for the Indianapolis 500, which was part of the Formula One circuit in the 1950s. Justin Moore is a computer scientist who occasionally dabbles in college football and Formula One analytics. He runs the Tempo-Free Gridiron and can be found at @TFGridiron.